Tag Archives for: "Michael L Steinberg Oakland County Defense Lawyer"
The Law Offices of Michael L. Steinberg is proud to report that Mr. Steinberg that he has been selected as a Super Lawyer for 2019. This the 9th year running for this honor. 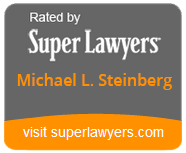 Super Lawyers is a peer-reviewed survey and Mr. Steinberg thanks his esteemed colleagues for their confidence. I consent to Michael L. Steinberg collecting my details through this form.